Back to the blog. Need to think more about painting and gardening and less about all this political nonsense, lies and deception. Radio 4′s World at One had to go off at lunchtime for inciting too much swearing at politicians. So… I am still working from my Californian notebooks and drawings. I have been looking for archetypal images that express a European idea of the American west: a cabin, a cove, a ghost town etc. I have been making drawings from drawings, trying to find a painterly way to say these things. I have made more notebook drawings and then charcoals from these. 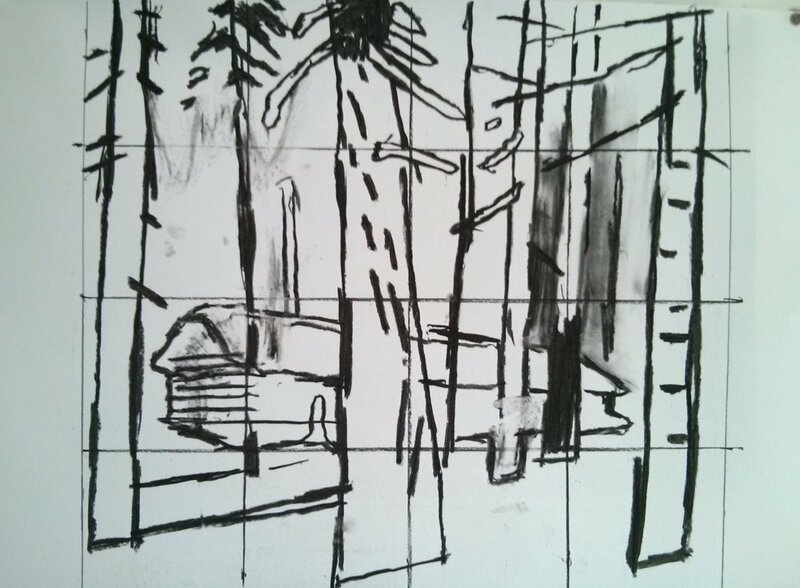 I have used the charcoals to start another acrylic on paper, trying to reconcile elements in the new drawings with the paintings on paper that are already beginning to work.